The intrusion of artificial light into ecosystems is of concern because there is evidence that this can have profound effects on wildlife, including plants, invertebrates, fish, amphibians, reptiles, birds and mammals, and may have effects on key ecological processes and ecosystem services. Determining the severity of these impacts rests, in part, on understanding of the spatial and temporal levels and patterns of artificial nighttime lighting, and particularly how these interact with those of different ecosystem, vegetation and habitat types. The Ecolight project has conducted analyses of spatial and temporal patterns of lighting using intercalibrated satellite images including the first assessment of the broad level of exposure of tropical and sub-tropical ecosystems to artificial light at night at a regional extent. 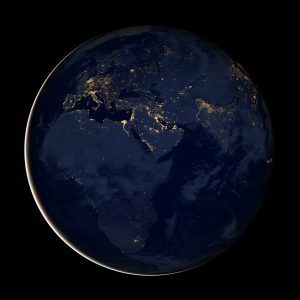 We have found that all global terrestrial ecosystem types experience some degree of exposure to artificial light, and that this exposure is increasing.